If you are a working individual or have errands to run on a day to day basis, then conveyance is something that you need to manage on a daily basis. And when it comes to managing expenses in this day and age of increasing costs, then everyone would love to save on conveyance. One of the most advanced and innovative conveyance solutions today come from the bike taxis that has been introduced by the brand Rapido that has generated huge amount of customer delight. And today, to woo in more and more customers, this brand also has introduced Rapido coupons that you can opt in for online at HappySale. Here the offers allow you to get your first ride completely free. In addition to that you can also get a 50% discount on your online bookings. Furthermore, there are deals where you can book a taxi at Rs.10 and browse through other deals! Verified on 23/4/2019 .. Rapido new user offer - Now get 50% discount on the first ride. Maximum discount will be upto Rs 30. Valid only once per user. Valid in Bengaluru, Mysuru & Gurugram cities only. Use code at the checkout to avail discounts. Book your bikes now. Verified on 23/4/2019 .. Rapido is offering the amazing discounts on bike taxis. 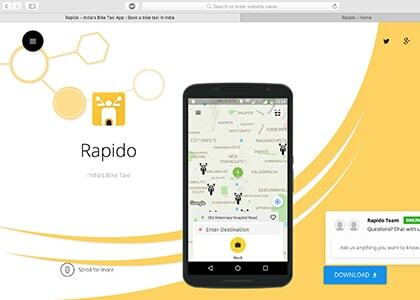 Book a Rapido bike taxi online at just Rs 10 only. Rs 5 will be charged per K/M of travel. Rapido referral coupon code is not required to get this offer. Book now and get this offer today! Book rides online at Rapido and get flat Rs 50 off. Apply coupon on your checkout page to get this offer. This offer is applicable only for Bangalore new users. Hurry up and avail now! Verified on 23/4/2019 . Rapido gives free ride on your online booking with Rapido bike taxi. Hurry! Download the app and use code to avail this offer. Valid for new users only. Book your bike now! Verified on 23/4/2019 . Rapido for Bangalore Users - Book a cab at Rs 2 Per Km at Rapido. Applicable only on Rapido Lite bookings online. Offer is valid for Bengaluru users only. Offer valid for both new and old users. No offer code required to get this best deal. Book now. Ever thought of commuting to work on a cab bike? A bike where you can choose as a way to commute just like a booking a cab… No? Then, you have look for Rapido, a unique bike taxi provider. It is taking the way of commuting in a much advanced. We are staying in a place where bikes play an important role when it comes to a country like India. Consider for commuting to work or anywhere else in the city, it is always best to travel on a bike. As the rides will be quicker and smoother. Currently, they are hosting the services in Bangalore, Gurgaon, and Mysore and planning to spread India. Prefer this app for these kinds of rides and do use Rapido coupon codes for making the ride light on your pockets. The main reason to use Rapido is to have an affordable and quick journey. The ease of finding a bike taxi is just easy. All you need to do is download the app on your smartphone and log in with your credentials. You can book a bike ride in just 2 taps!! yes, it wouldn’t take much time. So, even when you are in hurry also, you are assured that you will find the bike taxi in a jiffy. The app is designed in such way that there is no need to fill the destination every time you log in. You can save your home and work addresses which can make your booking quicker. Check on the Rapido promo codes to make rides much better. The safety of the pillions is given the utmost importance. Rapido offers the insurance for both the riders so that the ride can be considered as safe. The captains who are chosen are verified professionals who can drop you home safe. And to make the ride much smoother and hygienic, they provide the riders with shower caps and helmets for all the rides. It has amazing offers that include the free first ride for the first time riders, if you are lucky enough then you can receive 50% off on online bookings for new users, and lot more interesting offers. Stay tuned to this page for crazy deals.